Citizen went with a less subtle approach but amusing nonetheless. The Japanese team known for technological innovation pitched the “Eco-Drive Stealth. The first watch with cloaking movement.” Which at first hearing sounds like an intriguing advancement in horology. Until that is you see the advertisement image and all becomes clear… One of our favourite responses seen to date was “I would have bought it if it was automatic but apparently its a ‘wind up’”. Amazing to see the team at Tag heur taking time out from building high end swiss watches, sponsoring F1 teams and building campaigns with Leonardo di caprio to have a giggle with this 14 hand time piece that they announced. The release stated “Defying the time-honored conventions of Swiss Horology yet again, we introduce our highest level of precision and performance yet – the TAG Heuer Formula 1 GMT 12 Timezones – for the swamped jetsetter that simply doesn’t have time to adjust his watch. #aprilfools #DontCrackUnderPressure”. Bravo Tag! Turns out Tag Heuer aren’t the only jokers in the luxury market and queue Bremont’s addition to the April fools party. The team are known for their place as one of the finest producers of chronometers and are also official timekeeper of the America’s Cup and a sponsor of Oracle Team USA. They claim to have invented “the ultimate Americas cup sailing timepiece” by fixing the problem of a unreadable watch face by adding it’s very own windscreen wiper to clear any annoyance of sea spray. They finish “There are easy repairs to be made with your chopsticks without needing expensive watch repair tools. You may want to have a small air canister on hand to clean out the movement just in case any wooden fibers fall into the case or onto the dial.”. Finally but certainly not least was the A Blog to Watch’s new spin on popular dating App’s. Introducing “Windr” the “Match Making app for Watch Lovers”. Claimed to be born from the despair found as a lonely watch enthusiast constantly looking for a partner or friend to talk watches to. 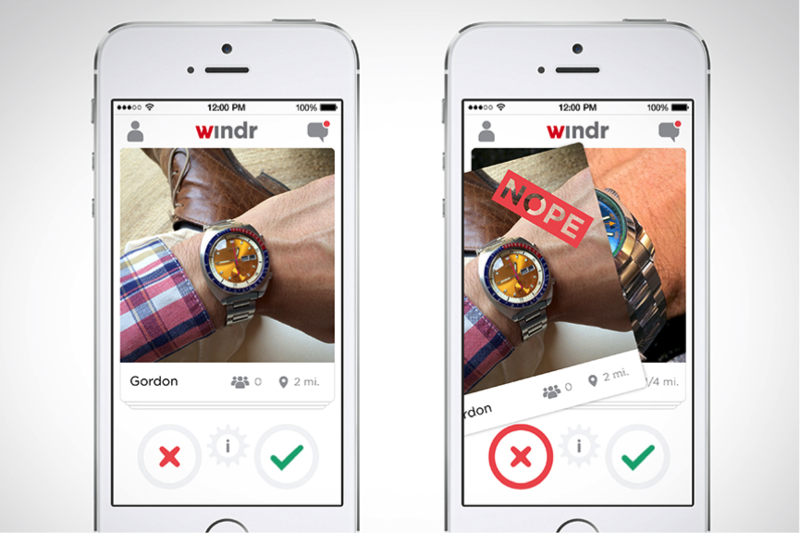 Windr uses the popular swipe format of app’s such as Tindr. “User profiles grow over time, offering a gallery of the wrist shots that they have taken in the past. These galleries are a key way potential “watch lover matches” know if the people they are looking at have similar collections and tastes” they explain. There maybe a few lonely watch enthusiasts still secretly hoping to find this in the app store.